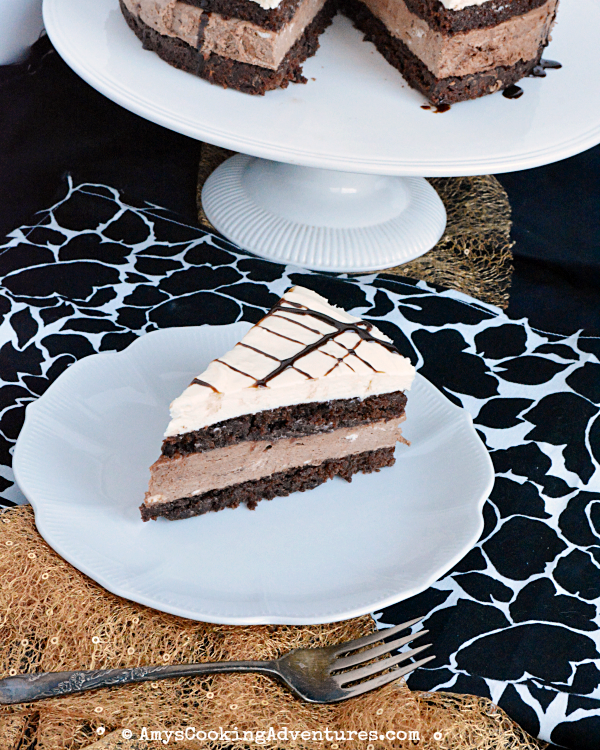 Hubs’ favorite desserts are brownies and cheesecake, so it’s always fun to find way to combine the two! 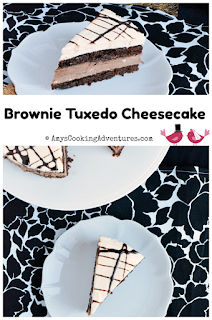 This yummy brownie tuxedo cheesecake starts off with brownies (I just baked up a box mix – I still haven’t found a homemade version that compares yet!) 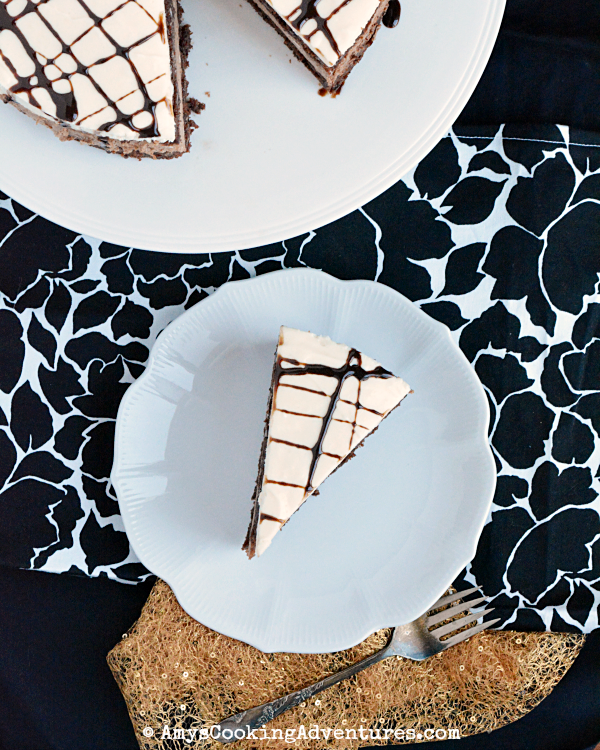 then combines with 2 flavors of no-bake cheesecake! The resulting cheesecake is so rich and delicious! It’s simply amazing. I made this cheesecake for Hubs’ birthday and there was so much there, we ended up taking half of it to work to share with co-workers! 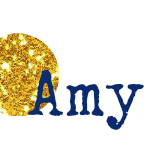 It’s my anniversary today! 11 years and going strong! Preheat the oven to 350 degrees F. Line two 9-inch pans with parchment and spray with non stick spray. Spray a 9-inch springform pan with non stick spray. Prepare the brownies as indicated on the packaging. Stir in the mini chocolate chips. Divide the batter evenly between the two 9-inch pans. Bake in the preheated oven for 15 minutes or until done. Remove from the oven and cool on wire racks. 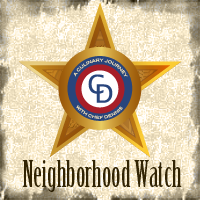 Place the cream cheese in the bowl of a stand mixer. Beat on medium speed for 8-10 minutes or until light and fluffy, scraping down the sides, as needed. Add the sour cream, sweetened condensed milk, and vanilla. Stir for a minute or two until well combined. Place the dark and white chocolate chips in separate bowls and melt in a double boiler or microwave, stirring until smooth. Set aside. Place the gelatin in a separate bowl and stir in the water. Microwave in 10-second bursts, stirring each time, until the gelatin is smooth and melted. Whisk 1 cup of the cheesecake mixture into the gelatin until smooth. Pour the gelatin mixture back in the remaining cheesecake filling and beat on high speed for 2-3 minutes. Immediately, pour half the mixture into each bowl of melted chocolate. Use a spatula to quickly fold the chocolate into the filing. Remove one brownie layer from the pan. Place the brownie layer into the greased springform pan. Pour the dark chocolate cheesecake filling over the brownie layer. Top with the next brownie later, the pour the white chocolate cheese cake filling over the top. Refrigerate overnight. 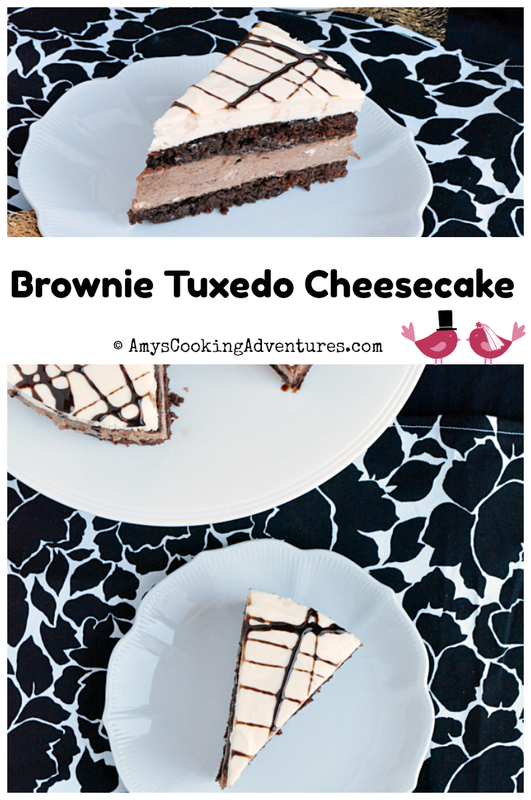 Brownie Tuxedo Cheesecake is a show stopping dessert that's perfect for birthdays, anniversaries, or any special occasion! Preheat the oven to 350 degrees F. Line two 9-inch pans with parchment and spray with non stick spray. Spray a 9-inch springform pan with non stick spray.Prepare the brownies as indicated on the packaging. Stir in the mini chocolate chips. Divide the batter evenly between the two 9-inch pans. Bake in the preheated oven for 15 minutes or until done. Remove from the oven and cool on wire racks.Place the cream cheese in the bowl of a stand mixer. Beat on medium speed for 8-10 minutes or until light and fluffy, scraping down the sides, as needed. Add the sour cream, sweetened condensed milk, and vanilla. Stir for a minute or two until well combined. Place the dark and white chocolate chips in separate bowls and melt in a double boiler or microwave, stirring until smooth. Set aside. Place the gelatin in a separate bowl and stir in the water. Microwave in 10-second bursts, stirring each time, until the gelatin is smooth and melted. Whisk 1 cup of the cheesecake mixture into the gelatin until smooth. Pour the gelatin mixture back in the remaining cheesecake filling and beat on high speed for 2-3 minutes.Immediately, pour half the mixture into each bowl of melted chocolate. Use a spatula to quickly fold the chocolate into the filing.Remove one brownie layer from the pan. Place the brownie layer into the greased springform pan. Pour the dark chocolate cheesecake filling over the brownie layer. Top with the next brownie later, the pour the white chocolate cheese cake filling over the top. Refrigerate overnight.